Overactive bladder (OAB) is a chronic, debilitating condition that impacts approximately 34 million Americans. Though OAB is a common condition, it is estimated that less than 30% of patients receive treatment, likely attributed to the reluctance of patients to talk to their healthcare providers about the condition. Left untreated, OAB can significantly impact a patient’s quality of life, including physical, psychological, social, domestic, occupational, and sexual aspects. The economic cost of OAB is also staggering, estimated at nearly $66 billion annually in the US. To improve patient quality of care and satisfaction, clinicians should take a proactive approach to screen patients and provide education regarding OAB. This should include information about normal lower urinary tract function, what is known about OAB, the benefits vs. risks/burdens of the available treatment options, and the importance of adherence to treatment. It is also essential for clinicians to educate their patients on expected outcomes from current therapeutic options and develop realistic patient-centered goals for treatment. As the science relevant to OAB evolves and improves, and the literature continually expands, PCPs must stay up-to-date on new treatment strategies and therapeutic options. With the implementation of the Affordable Care Act, many who were previously uninsured will now pursue medical assistance to manage long-standing signs and symptoms. Often-times, the first provider-patient contact will be with a PCP, who will be in an ideal position to screen, diagnose and treat patients with OAB. 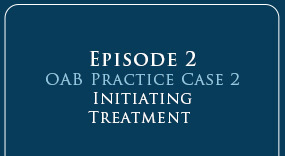 This educational activity is designed as a comprehensive approach to address the practice needs of primary care providers, including family physicians, physician assistants, nurse practitioners, and allied healthcare professionals, who are at the forefront of caring for adult patients who may be suffering from OAB. This program targets healthcare providers who are involved in the screening and management of patients experiencing symptoms of OAB. This webcast on demand is based on the CME Satellite Symposium presented during the AAFP Scientific Assembly and is divided into three episodes. 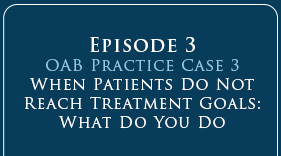 Each episode opens with an interactive patient case scenario that reflects the challenges and decision-making process that occurs regularly in clinical practice when caring for patients with OAB. Please Note: If you have received credit for attending the live symposium by the same name, you are not eligible to apply for credit for this online version. When Patients Do Not Reach Treatment Goals: What Do You Do? This activity has been planned and implemented in accordance with the accreditation requirements and policies of the Accreditation Council for Continuing Medical Education through the joint providership of the Center for Independent Healthcare Education and Vemco MedEd, LLC. Center for Independent Healthcare Education (Center) is accredited by the Accreditation Council for Continuing Medical Education to provide continuing medical education for physicians. AAPA accepts AMA PRA Category 1 Credit™ for the PRA from organizations accredited by ACCME. Nurse Practitioners will receive certificate of AMA PRA Category 1 Credit™ as this is an ACCME accredited program and its accreditation is recognized by Nurse Practitioner boards. Please note that to receive credit you must achieve a score of at least 70%. Certificate of Credit will be emailed within 4 weeks of successful completion of the activity. Dr. Karram does not discuss the off-label use of a product. Dr. MacDiarmid does not discuss the off-label use of a product. Dr. Shenot does not discuss the off-label use of a product. No (other) speakers, authors, planners or content reviewers have any relevant financial relationships to disclose. No (other) speakers or authors will discuss off-label use of a product. Copyright © 2015 Vemco MedEd, LLC. All Rights Reserved. Permission for accreditation use granted to Center for Independent Healthcare Education. 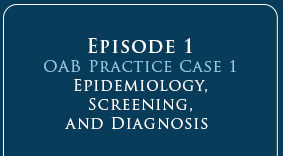 By clicking on an Episode below, I acknowledge that I have read the entire CME information.